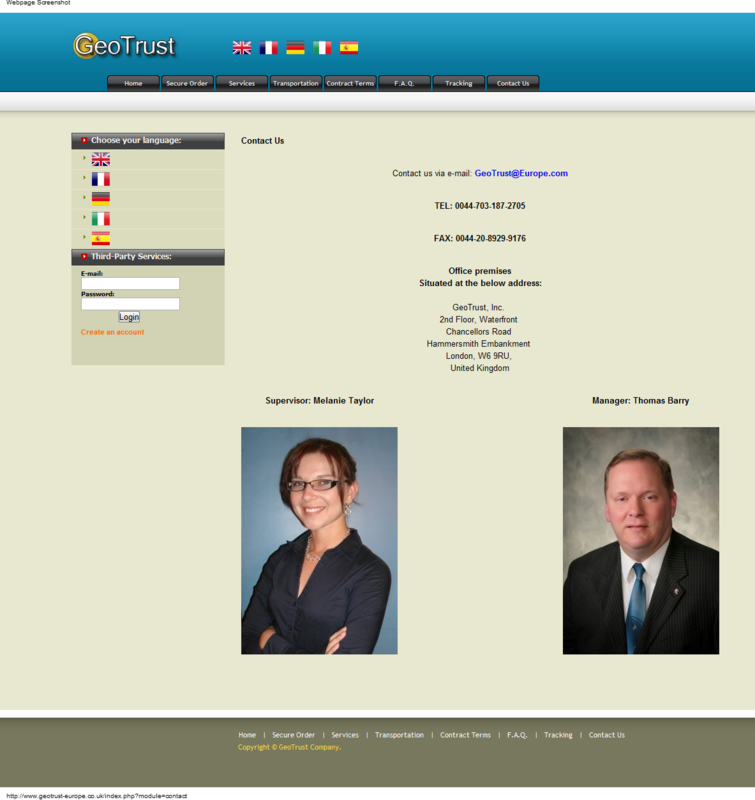 The sites were created by the same scammers. 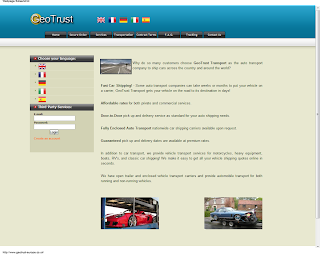 Why do so many customers choose GeoTrust Transport as the auto transport company to ship cars across the country and around the world? Fast Car Shipping! - Some auto transport companies can take weeks or months to put your vehicle on a carrier, GeoTrust Transport gets your vehicle on the road to its destination in days! Affordable rates for both private and commercial services. Door-to-Door pick up and delivery service as standard for your auto shipping needs. Fully Enclosed Auto Transport nationwide car shipping carriers available upon request. Guaranteed pick up and delivery dates are available at premium rates. In addition to car transport, we provide vehicle transport services for motorcycles, heavy equipment, boats, RV's, and classic car shipping! We make it easy to get all your vehicle shipping quotes online in seconds. The company based in all Europe, is a privately held company that has pioneered the process of online secure-shipping services announced their creation of a Vehicle Services Division. The Company, founded in 2008 by Fidelity National Financial, has established itself as the leading provider of secure business and consumer transaction management on the Internet. Shipping services are provided through strategic relationships with companies, to lenders and institutions requiring secure online transactions, and to individuals who seek to protect themselves when conducting business over the Internet. The Vehicle Services Division was created for the specific purpose of processing all issues related to the purchase, title transfer, lien registration, inspection and transport of vehicles. 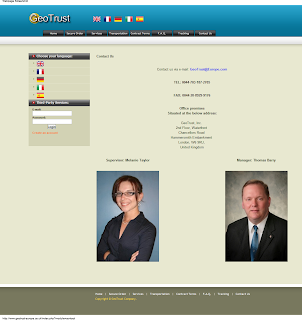 Whether the transaction is a simple direct purchase for an individual or a more complex transaction involving a multiple parties, the unique range of services offered by GeoTrust Transport is always available as a proven and invaluable tool for dealers, lenders and individuals contemplating purchasing a vehicle over the Internet. 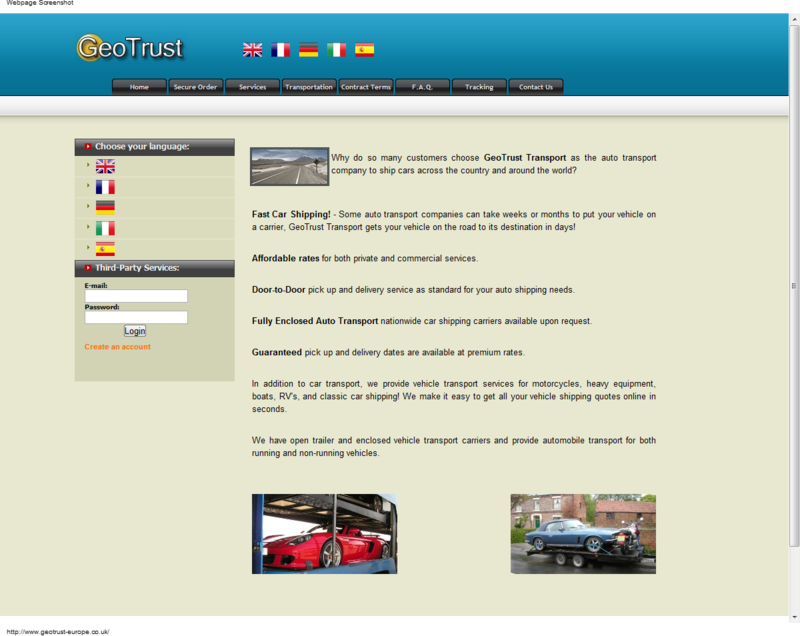 One of the limitations of purchasing a vehicle over the Internet is verifying the condition of the vehicle prior to arranging for payment or transport. Customers avoid this dilemma by ordering the GeoTrust Transport Vehicle Inspection Report. 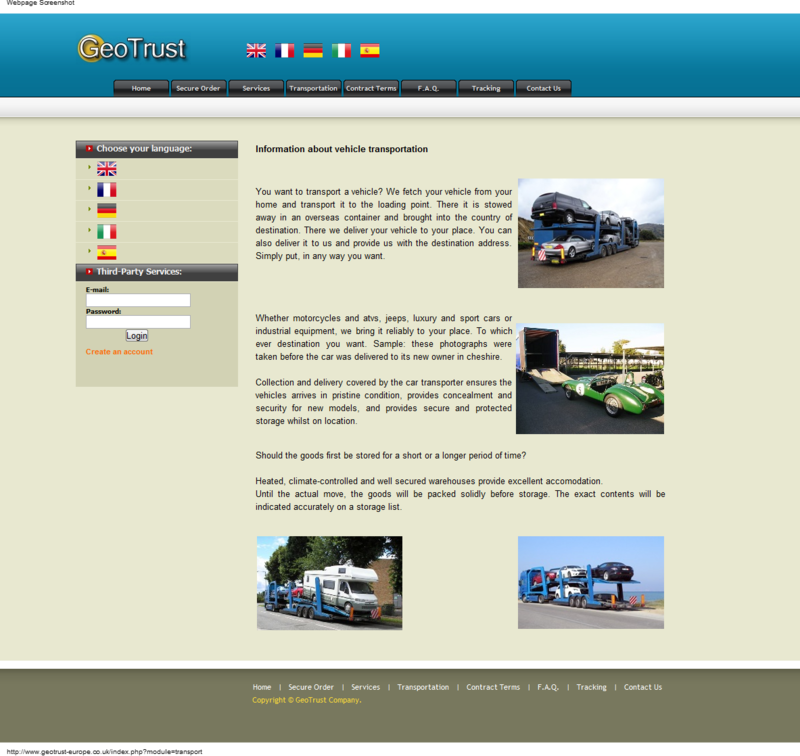 For this service GeoTrust Transport has partnered with AutoVIN. AutoVIN provides “off lease” inspect. When Buyers and Sellers don't know each other, they need a third-party they can trust to turn to. That's where World-Distribution comes in. As the most trusted escrow service on the Internet, World-Distribution.com makes sure transactions are secure and worry-free. World-Distribution.com is also the single point of contact to track and manage all aspects of the transaction, even third-party suppliers. Our Company-Shipping can assure you that buying through us you will receive your car, truck, bike, atv's...etc. If you have already bought goods over the Internet, you know what the potential risks are when buying from an unknown seller. If you sell goods in online auctions, on restricted web sites, private web pages, or through Internet newsgroups, you know that the online buyers want to use their credentials. 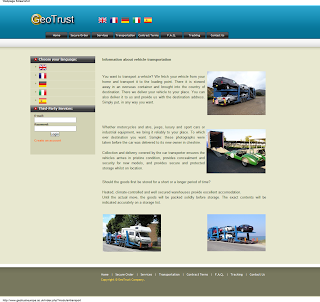 Whatever the case GeoTrust Transport can help you. Our company is an impartial third party, whose task is to facilitate the on-line buying and selling, guaranteeing security, reliance and convenience for both parties. Reduces the risks of fraud for those who are buying or selling over the Internet, when dealing with consumer-to-consumer, business-to-consumer or business-to-business transactions. Transports your vehicle on an open car carrier, similiar to the ones used to transport new cars from manufacturers to auto dealers. Your vehicle will be picked up from your door by a a multiple car carrier or a flat-bed carrier. 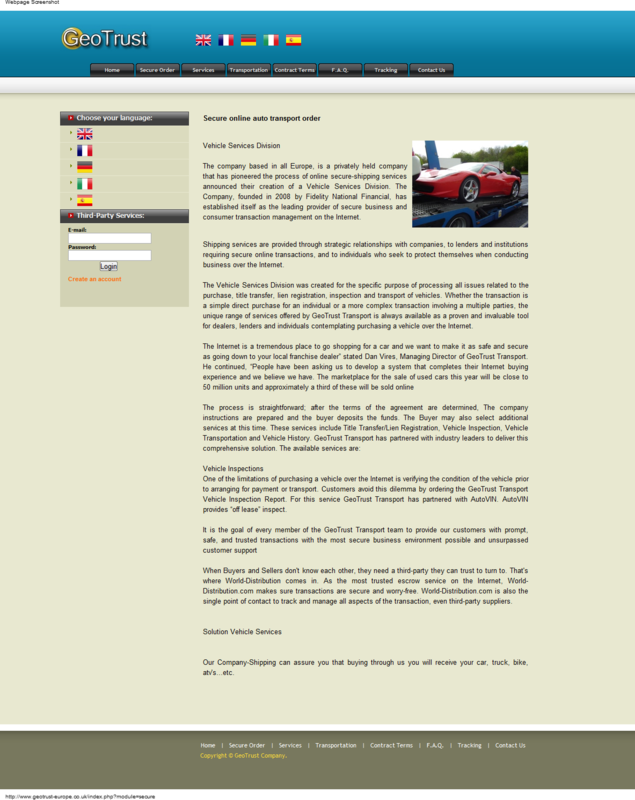 We then transport your auto to your specified destination. Pickup times are pre-arranged in advance and an estimated delivery delivery date is given when the order is placed. This is the most convenient way to transport your vehicle. We understand that some vehicles need special attention so we also offer enclosed transportation for your auto transport needs. Your vehicle will be transported on a completely enclosed trailer designed to transport classic automobiles, prototypes or vehicles that cannot be exposed to inclement weather. When asking for a quote, please let us know in advance that you require an enclosed trailer. You will receive the same exceptional auto transport service that we deliver with our door-to-door service, except will pick up and deliver your vehicle to one of our nationwide terminals. This service is available for your convenience and storage charges apply. You want to transport a vehicle? We fetch your vehicle from your home and transport it to the loading point. There it is stowed away in an overseas container and brought into the country of destination. There we deliver your vehicle to your place. You can also deliver it to us and provide us with the destination address. Simply put, in any way you want. Whether motorcycles and atvs, jeeps, luxury and sport cars or industrial equipment, we bring it reliably to your place. To which ever destination you want. Sample: these photographs were taken before the car was delivered to its new owner in cheshire. Collection and delivery covered by the car transporter ensures the vehicles arrives in pristine condition, provides concealment and security for new models, and provides secure and protected storage whilst on location. Should the goods first be stored for a short or a longer period of time? Heated, climate-controlled and well secured warehouses provide excellent accomodation. Until the actual move, the goods will be packed solidly before storage. The exact contents will be indicated accurately on a storage list. 1. Motor carriers transporting the vehicle will only accept Money Order for balance before delivery of your vehicle. Please have funds available for your delivery. 2. Motor carrier transporting the vehicle, if driver feels he cannot maneuver or operate in said area or neighborhood, it is the responsibility of the person receiving said vehicle to meet the driver for delivery of vehicle. 3. By owner's signature or owner's agent signature, OP and the motor carrier transporting the vehicle and their employees are authorized to operate and transport said vehicle, along with drive said vehicle for pick up/delivery. 4. Owner/Shipper agrees to understand that the transport company will route vehicles from origin to destination by route within their discretion and does not agree to any specified routing. 5. OP agree to transport the vehicle on any particular motor carrier, for any particular market or event, but will not be responsible for loss or damage by an unavoidable delay. 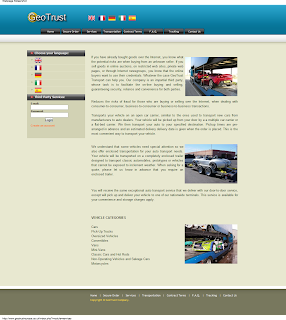 We are able to provide you with an estimated pick up and arrival date of your vehicle. (The performance of the Trucking Company transporting the vehicle and possible delays due to weather, road conditions, mechanical problems, etc.) There are absolutely no guarantees regarding delivery times and dates. OP and the motor carrier will not be held responsible for car rental fees or any accommodation fees if applicable. 6. Inoperable vehicles are subject to additional charges. If the vehicle is inoperative such that it cannot be driven on and off a truck under its own power, please tell us so we can give you a correct quote. In the event that we are not told that a vehicle is inoperative at the time of giving you a quote and it is discovered upon pick up an additional fee of up to 80.00 will be added to the final amount to be collected before the car is delivered. Additionally, in the event we are not informed of the correct model and type of the vehicle, including racks, extensions, oversized tires, etc., which render the vehicle oversized when we give you a quote, and we discover the oversized nature of vehicle upon pick up, an additional fee of up to 160.00 will be added on to the final amount to be collected before the vehicle can be delivered. Please confirm the accuracy of all information you give when asking for a quote for transportation. 7. Should the order be cancelled and cancellation was requested not due to any non-performance by OP and deposit was paid by check or credit card, an administrative charge of $15.00 will be assessed. If cancellation occurs and vehicle has been assigned a truck and we are not given proper notice, the owner/shipper will not be entitled to a refund of monies already deposited. 8. The following items are not to be in the vehicle at time of shipment: Explosives, Guns, Ammunition, Flammable Products, Narcotics, Negotiable and Legal Papers, Alcoholic Beverages, Jewelry, Furs, Money, Live Pets, Live Plants or Contraband. Owner/Shipper agrees that OP or motor carrier may confiscate or dispose of said items with no remuneration. OP and motor carrier will not be held responsible for delivery of personal property. If you wish to put items in the vehicle you do so at your own risk. 9. If there is any problem regarding a trucking delivery the regulations of the Interstate Commerce Commission require that all outstanding freight charges must be paid without deduction. 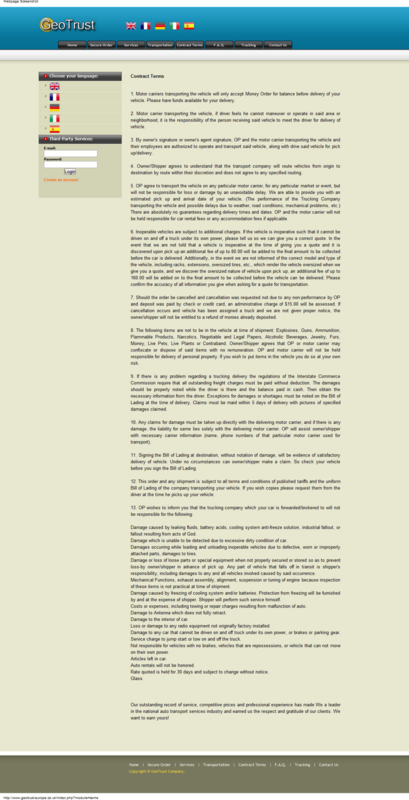 The damages should be properly noted while the driver is there and the balance paid in cash. 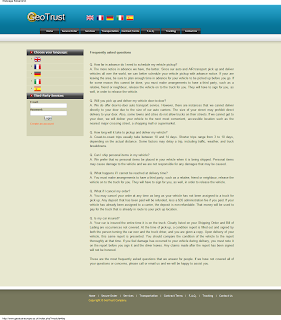 Then obtain the necessary information from the driver. Exceptions for damages or shortages must be noted on the Bill of Lading at the time of delivery. 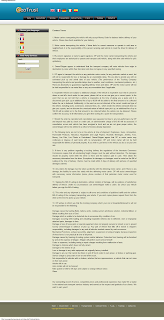 Claims must be maid within 5 days of delivery with pictures of specified damages claimed. 10. Any claims for damage must be taken up directly with the delivering motor carrier, and if there is any damage, the liability for same lies solely with the delivering motor carrier. OP will assist owner/shipper with necessary carrier information (name, phone numbers of that particular motor carrier used for transport). 11. Signing the Bill of Lading at destination, without notation of damage, will be evidence of satisfactory delivery of vehicle. Under no circumstances can owner/shipper make a claim. So check your vehicle before you sign the Bill of Lading. 12. This order and any shipment is subject to all terms and conditions of published tariffs and the uniform Bill of Lading of the company transporting your vehicle. If you wish copies please request them from the driver at the time he picks up your vehicle. Damage caused by leaking fluids, battery acids, cooling system anti-freeze solution, industrial fallout, or fallout resulting from acts of God. Damage which is unable to be detected due to excessive dirty condition of car. Damages occurring while loading and unloading inoperable vehicles due to defective, worn or improperly attached parts, damages to tires. Damage or loss of loose parts or special equipment when not properly secured or stored so as to prevent loss-by owner/shipper in advance of pick up. Any part of vehicle that falls off in transit is shipper's responsibility, including damages to any and all vehicles involved caused by said occurrence. Mechanical Functions, exhaust assembly, alignment, suspension or tuning of engine because inspection of these items is not practical at time of shipment. Damage caused by freezing of cooling system and/or batteries. Protection from freezing will be furnished by and at the expense of shipper. Shipper will perform such service himself. Costs or expenses, including towing or repair charges resulting from malfunction of auto. Damage to Antenna which does not fully retract. Damage to the interior of car. Loss or damage to any radio equipment not originally factory installed. Damage to any car that cannot be driven on and off truck under its own power, or brakes or parking gear. Service charge to jump start or tow on and off the truck. Not responsible for vehicles with no brakes, vehicles that are repossessions, or vehicle that can not move on their own power. Auto rentals will not be honored. Rate quoted is held for 30 days and subject to change without notice. Our outstanding record of service, competitive prices and professional experience has made We a leader in the national auto transport services industry and earned us the respect and gratitude of our clients. We want to earn yours! Q. How far in advance do I need to schedule my vehicle pickup? A. The more notice in advance we have, the better. Since our auto and AIR transport pick up and deliver vehicles all over the world, we can better schedule your vehicle pickup with advance notice. If your are leaving the area, be sure to plan enough time in advance for your vehicle to be picked up before you go. If for some reason this cannot be done, you must make arrangements to have a third party, such as a relative, friend or neighbour, release the vehicle on to the truck for you. They will have to sign for you, as well, in order to release the vehicle. Q. Will you pick up and deliver my vehicle door-to-door? A. We do offer door-to-door auto transport service. However, there are instances that we cannot deliver directly to your door due to the size of our auto carriers. The size of your street may prohibit direct delivery to your door. Also, some towns and cities do not allow trucks on their streets. If we cannot get to your door, we will deliver your vehicle to the next most convenient, accessible location such as the nearest major crossing street, a shopping mall or supermarket. Q. How long will it take to pickup and deliver my vehicle? A. Coast-to-coast trips usually take between 10 and 14 days. Shorter trips range from 3 to 10 days, depending on the actual distance. Some factors may delay a trip, including traffic, weather, and truck breakdowns. Q. Can I ship personal items in my vehicle? A. We prefer that no personal items be placed in your vehicle when it is being shipped. Personal items may cause damage to the vehicle and we are not responsible for any damages that may be caused. Q. What happens if I cannot be reached at delivery time? A. You must make arrangements to have a third party, such as a relative, friend or neighbour, release the vehicle on to the truck for you. They will have to sign for you, as well, in order to release the vehicle. Q. What if I cancel my order? A. You may cancel your order at any time as long as your vehicle has not been assigned to a truck for pick up. Any deposit that has been paid will be refunded, less a $35 administration fee if you paid. If your vehicle has already been assigned to a carrier, the deposit is non-refundable. That money will be used to pay for the truck that is already in route to your pick up location. A. Your car is insured the entire time it is on the truck. Clearly listed on your Shipping Order and Bill of Lading are occurrences not covered. At the time of pick-up, a condition report is filled out and signed by both the person turning the car over and the truck driver, and you are given a copy. Upon delivery of your vehicle, this same report is presented. You should compare the condition of the vehicle to the report thoroughly at that time. If you feel damage has occurred to your vehicle during delivery, you must note it on the report before you sign it and the driver leaves. Any claims made after the report has been signed will not be honored. These are the most frequently asked questions that we answer for people. If we have not covered all of your questions or concerns, please call or email us and we will be happy to assist you.